We are delighted that you are considering HRA for your child's education. The Academy offers a comprehensive education in a Catholic, Christian environment. We recognize that parents and guardians are the first educators of their children and your role cannot be underestimated. When you entrust your child to the Holy Rosary Catholic community, you become partners with us in empowering your child in body, mind and spirit. We encourage you to visit us in person! Check for dates when open houses are scheduled, or simply contact Alaina Dougharty, in the admissions office to set an appointment for a personal tour. Holy Rosary Academy has been guiding and educating children since 1954! HRA starts with Pre-K and continues through 8th grade. Students are educated in the Catholic Faith and attend Mass twice weekly with their classmates and teachers, where they are active participants as lectors and musicians. Students wear uniforms which are purchased through Mills Company Uniforms. The Academy was named a 2013 National Blue Ribbon School of Excellence by the U.S. Department of Education for "exemplary high performing." 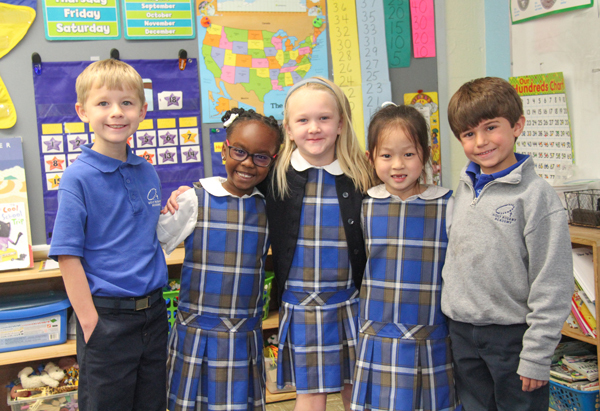 Holy Rosary Academy is fully accredited by the State of Tennessee, the Diocese of Nashville, and AdvancEd, formerly known as "SACS" (the Southern Association of Colleges and Schools). In addition to all core subjects, Academy students receive instruction in Spanish, computer/technology, music and art, and visit the library/media center weekly. All students have daily recess, and a regular structured P.E. class. Band is offered for students in grades 5 through 8. The Academy incorporates the use of the Accelerated Reading and Math programs for students. All classrooms are equipped with computers and interactive SmartBoards to immerse students in technology and lessons that are relevant and engaging. Our faculty members are certified teachers, and many of them hold Master's degrees. Before- and after-care is available for an additional fee through HRA's Escape program. Limited bus service is available for an additional fee for HRA students from Wilson County and Hermitage, as provided by Pope John Paul II High School. The Academy has a tuition assistance program. For consideration, parents must apply through the FACTS website by March 31. Enrichment activities include visiting speakers, museum services, musicians, theatrical groups and other performing artists. All grade levels have educational field trips that include live theatre and historic homes/locations. Extracurricular activities for HRA students include scouts, chess club, sports, choir, forensics, drama, science olympiad, Engineering for Kids, and a young authors club.